Historic Old San Ysidro Church is 150 years old this year! Help celebrate her sesquicentennial with your interpretation of any aspect of her, from steeple to footing, from corbels to cracks in her mudding (well, every Grande Dame has a few wrinkles). Just one original art piece accepted from each artist, please. Any “two-dimensional wall art” medium accepted (painting, crayon, collage, fiber art, pastels, pencil, mixed media, etc.). All ages welcome. Some images of the Old Church may be selected to be reproduced on future Corrales Historical Society promotional materials (calendar, note cards, posters, etc.) with artists’ permission and acknowledgement (free advertisement!). 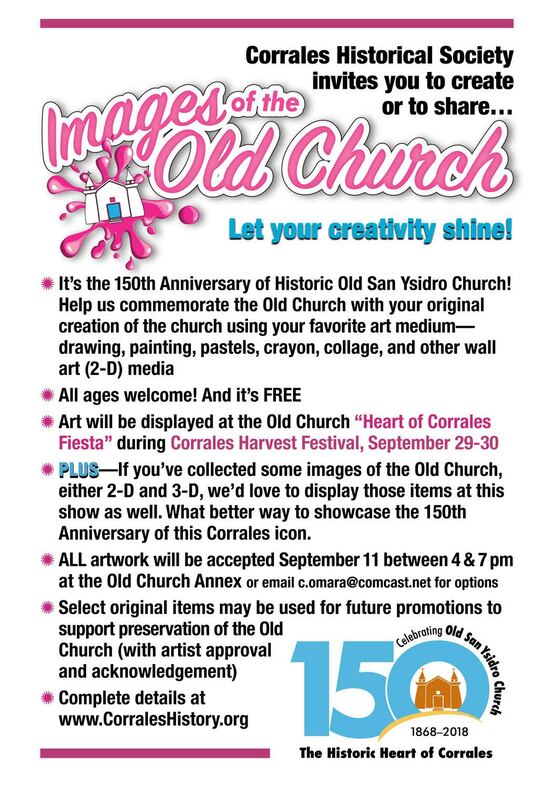 Your newly created masterpieces will be displayed at the Old Church Heart of Corrales Fiesta, September 29-30 (during the village-wide Corrales Harvest Festival). Deadline for entries is September 11, 2018. You may submit a JPEG image of your artwork online in the form below. Walk-In Entries are also welcome. We will accept walk-in entries (walk in with your masterpiece in hand) at the Old Church Annex office (just a few steps to the south of the church) between 4:00 and 7:00 p.m. on Tuesday, September 11, 2018. Or you can email c.omara@comcast.net to make other arrangements. THERE IS NO FEE TO ENTER! HERE’S ANOTHER WAY TO PARTICIPATE! Many of you have collected various images of the Old Church through the years—both two- and three-dimensional. We’d love to display these items at the show as well as your original 2-D artwork. What better way to showcase the 150th Anniversary of this Corrales icon! So bring them in! Again, we’ll be accepting ALL artwork September 11 at the Old Church Annex between 4:00 and 7:00 pm. Or make other arrangements by emailing c.omara@comcast.net. If you are under the age of 18 please include your parent's information in the fields below. You may submit a JPEG file of your art medium below.